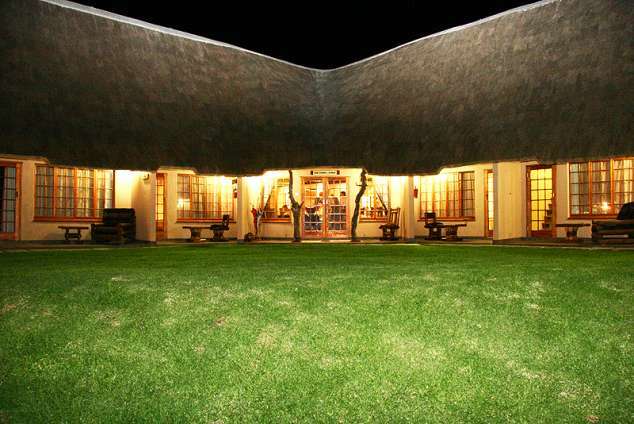 Trenchgula Guest Lodge - Ladysmith Accommodation. In a peaceful game farm setting, nestled below the war graves of the Anglo-Boer War on the top of Trenchgula Hill, lies a luxury 4-star quality GUEST LODGE with 8 rooms under thatch, each with a double bed and a single bed in the loft. The Lodge is wheelchair friendly. Each room is en-suite, has a separate entrance with a private verandah, TV (M-Net, SABC, movie and sport), air-conditioning, under floor heating, tea & coffee facilities, telephone and wireless internet connection. Breakfast and dinner is served in a well appointed dining room with an intimate get together bar on a mezzanine floor which leads out to a game viewing deck. The lodge is within a game farm surrounded by an electric fence with gate control access and has undercover parking. zebra and a variety of bird species. walking and visiting Anglo-Boer War graves on the property. Trenchgula Guest Lodge is situated 3km on the D343 (Hyde Road extention past Hacienda complex) and only 7km from the Ladysmith CBD. 30811 page views since 03 Apr, 2007.